You’ve already learned that stormwater issues occur when rain falls on impervious surfaces. This rain carries pet waste, fertilizer, leaf debris, pesticides, salt, and other chemicals into storm drains, which eventually lead to local waterways. But how do these pollutants travel from point A (your home) to point Bay? In a natural system, rainwater would simply soak into the ground, but in developed areas rainwater flows off sidewalks, driveways, and roads. That’s where storm drains come in. Storm drainage systems help to rapidly prevent flooding by keeping stormwater off the streets. Above ground, you can see roadside ditches and curb inlets. These connect to channels and pipes that carry the stormwater deep underground. Many people mistakenly think that storm drains carry this water to a treatment facility. Wastewater that drains down sinks and toilets is sent through a different system to a treatment facility. However, according to the Richmond Department of Public Utilities, in many urban areas stormwater does not flow to a wastewater treatment plant to be filtered. As you know, Runoff Busters, out of sight does not mean out of mind – or out of the watershed. These pipes will route large quantities of stormwater during a rainfall event. 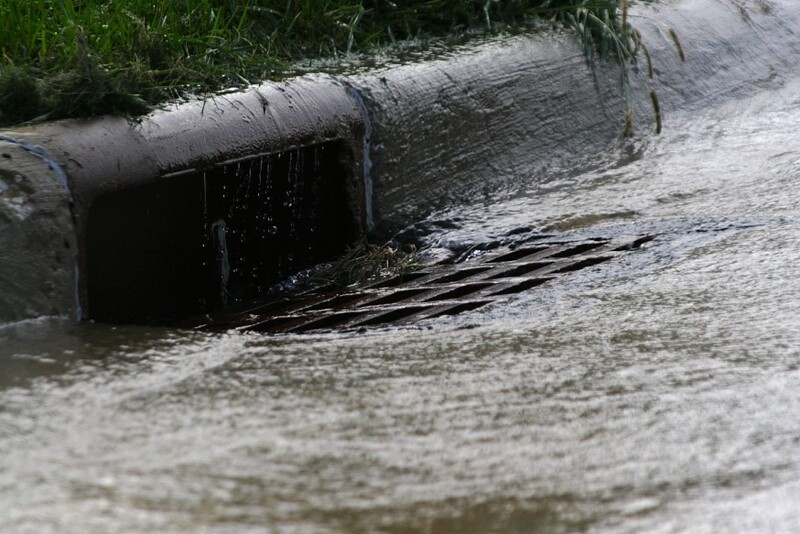 Sometimes older sewage systems are even overwhelmed by heavy rain and raw sewage mixes with storm drain water. All of this untreated stormwater empties directly from outflow pipes into local bodies of water. Storm drains are necessary to help prevent flooding, and are a direct connection between neighborhoods and bodies of water hundreds of miles away. Stenciling positive messages on storm drains such as “only rain down the storm drain”, or adding plaques with the name of the water body it connects to, are some ways that can help remind us to take care of our storm drains. Most storm drains – and everything carried by the water entering them – go directly to nearby streams. In older cities they may pipe stormwater to treatment facilities, but this opens up a number of other problems when the systems are over capacity. Best bet is to only let rain in the drain! It is illegal to dump waste into a storm drain, but some of the most problematic pollutants get incorporated in stormwater without us even thinking about it. To prevent debris, sediment, and chemicals from entering storm drains, make sure to sweep up trash from your yard and cover dumpsters to avoid leaks. Avoid using fertilizer or pesticides on your yard whenever possible. Disconnect downspouts, which are directly attached to storm drainage systems, and aim them at your garden. Rain gardens with compost and native plants, and rain barrels can also help to intercept and filter polluted stormwater before it enters the drain system. Previous Previous post: « What’s Bugging You? Also known as Bayscapes, this is the practice of incorporating environmentally sensitive design, low impact development, non-invasive native plants, and/or integrated pest management to create a diverse landscape that helps to protect clean air and water and support wildlife. Native flowers offer both beauty and ecological benefits to landscapes.